We owe our growth and success to you, our loyal clients. We wanted a unique way to demonstrate our appreciation. This sparked our idea to create the Premium Membership Program to help save you money through discounted services you already use! We decided to take a closer look at some of our most popular add-on services and provide them at a lower rate through a yearly membership. Here’s how it works: you pick which membership option is best suited for you and your listings, and you save money on services you’re already using on a regular basis. The Silver Membership offers a RUSH delivery (with next business day turn around time) on all of your tours for the year for a one time payment of $199 for the year. That means, if you add a RUSH to more than four tours a year, you are getting them for FREE! 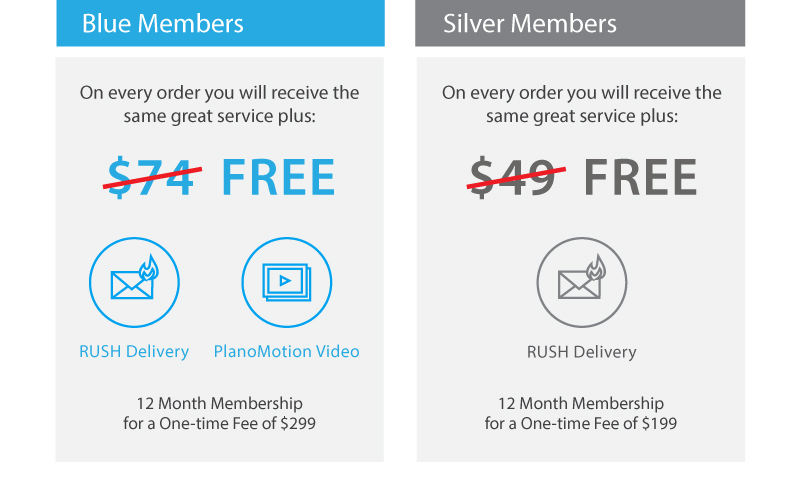 The Blue Membership provides you the same RUSH delivery + a PlanoMotion video on every single tour through the year for a one time price of $299. If you order more than four RUSH and PlanoMotion videos for your listings each year, you are getting the rest for FREE. You understand the importance of showcasing your listings through quality marketing to get them sold fast. We understand the importance of saving your well-earned money while doing so. With the Premium Membership Program, we all win.